(Clockwise from top): Detail of the medieval map Carta marina; the Speicherstadt (warehouse district) in Hamburg, Germany; Andrew Couch (photo credit: Andrew Couch). Living as an expat in another culture forces you to interact with the world in a different way. You cannot rely on the habits of your home and things around you are strange—sometimes really really strange. Yet they are perfectly normal to the locals. This echoes my experience of reading (and now writing) fantasy fiction. I didn’t really think about it that way until I started writing this post, but I guess it should have been obvious all along. I’ve always loved the fantasy genre, ever since I could read. The first book I remember was Voyage of the Dawn Treader, by C.S. Lewis, although I certainly delved into Tolkien’s The Hobbit very early on as well. Both are fantasy but also involve travel. As a child, I was drawn to the imagery of the strange places depicted in these books. 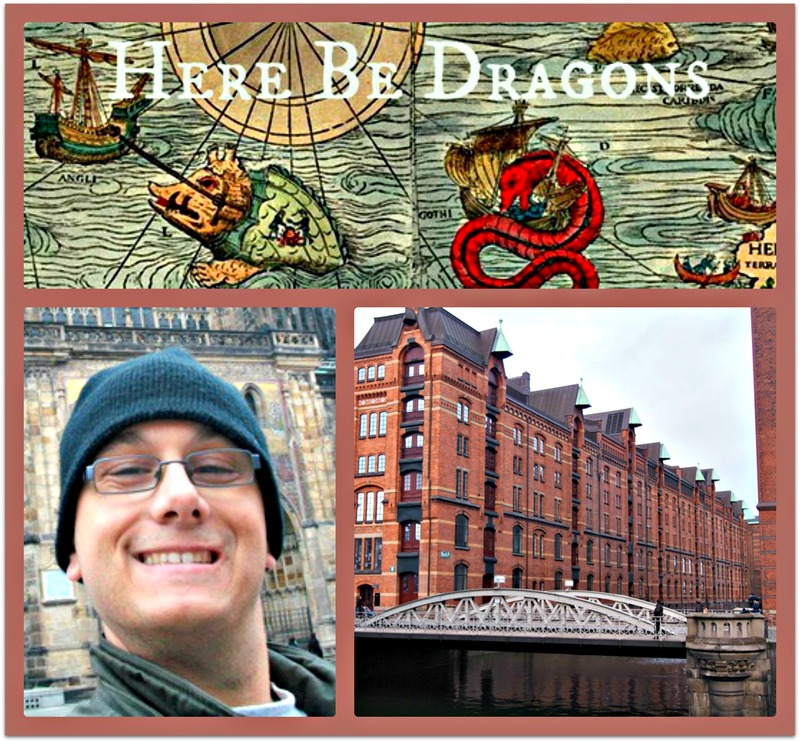 Maybe that feeling of diving into fantastical worlds is what led me to a life of travel as an adult, and ultimately to the life I now have in Germany as an expat. The characters in fantasy novels accept their world as it is. They might accept that magic exists in a specific form—or that elves, trolls and ogres wander the street selling sausages. Is this really so much of a stretch from what we accept as expats sometimes? After living for six years in Germany, I almost take for granted how orderly everything is: I like knowing that the tram will come at an exact time. I’ve also come to appreciate being able to sit in a restaurant all evening without anyone shoving the bill at me to pay and leave. I do notice, though, that the more I integrate with the local life, the more I crave a creative outlet. Several years ago, when I’d been living in Freiburg for a couple of years, my apartment lease was running out and I had to decide: should I find a new place to live, or was it time to move on? In the end, I decided to buy my own apartment, which tied me still more closely to the wonderful town of Freiburg. I was happy but also felt that doors were closing, and I needed to seek other outlets. I ended up starting a blog, Grounded Traveler: Expat life in Germany and still seeing the world. I tried writing fiction, too, but must not have been ready. Just last year I made a career shift. For 13 years I had worked as a Web developer for an employer, but I decided to leave and start my own freelancing business. Being my own boss has given me the freedom to do what I want when I want, but there are limits on that freedom as I must constantly be on the lookout for projects. Craving the fantastic once again, I started writing a series of fantasy novellas. 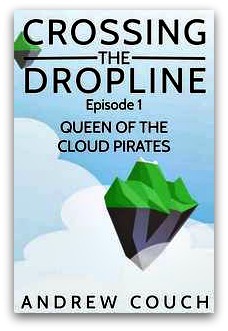 I self-published the first episode, Queen of the Cloud Pirates, in March and am working on the next one now, based on the inspiration of living and traveling abroad. Much of my inspiration for writing fantasy comes from the places my wife and I visit on our travels. My follow-on novella to Queen of the Cloud Pirates (I’ve just finished the first draft) is set in a fantasy port city. Not long ago, my wife and I traveled to Hamburg for a few days and spent time in Speicherstadt, an area of the city full of canals and towering brick warehouses with elevators and cranes around them. On that occasion I let my imagination go, wondering what a sword fight among the ropes and narrow stairs would be like. This has driven a fair amount of the book’s setting. A man sat hunched over in the subway seat, his chin piled on top of both hands steadying himself on his cane. A white fluffy mustache flowed over the side of his hands like a cascade of falling clouds. His oh-so-attentive eyes, in contrast to his nearly decrepit body, watched from beneath equally fluffy eyebrows that flowed up in the same way the mustache floated down. Was this a visitor from the realm of clouds come to watch us on earth? I pondered the significance of seeing this man underground as I got off at my stop and watched him through the window as the train sped away. I am constantly collecting such snippets and images on my travels. In fact, I’m now half-way through another story based on a mis-heard subway announcement about the train ending and needing to transfer to the “elephants”—well, that’s not what the conductor said but it’s how I heard it. I have been thinking about the story so much I can’t really remember the original line, but I expect I heard something about transferring to bus line 11 (elf in German) and, despite being fluent in German, thought of elephants. Readers, do you collect thoughts and ideas when traveling to, or living in, strange surroundings? And if so, are you inclined to turn these snippets into stories? While I have a fantasy-oriented imagination, and tend to see dragons or other fantastical beasts when venturing into new territory, I imagine that such snippets could support any genre of writing. I look forward to seeing you next month, when I will continue exploring how encounters with different landscapes, cultures, cities, architecture, and people can stimulate the imagination in some strange and wonderful directions. Let me know in the comments if you’re fantasizing about any particular topics, and I’ll see if my imagination can stretch to accommodate. Andrew Couch has been a fantasy book nut since childhood; he really has not grown up much since then. After struggling to write his own games for years, he is now creating fantastical worlds in a series of novellas that echo the TV shows, anime and role-playing games of his youth. Beyond fantasy he is an avid blogger and a world traveler who resides in Germany. To learn more about Andrew, check out his blog, Grounded Traveler, and follow him on Twitter: @groundedtravelr. THE LADY WHO WRITES: Expats, there may be a novel in your novel life! Hi Andrew- I will be traveling to Germany next week, so I will be checking out your blog. Was planning on stopping in Freiburg as I had an old friend there – but alas we seem to have lost contact. Also my great- grandfather came from nearby village of Mittelstadt (sp.) – have you heard of it? Keep writing. HI Cinda, Freiburg is still a wonderful stop even without a contact. It has a charming old city. I will probably write about it in the column at some point as well. The Black Forest nearby is the source of a lot of Grimm’s Fairy tales. No I haven’t heard of Mittelstadt. It sounds like a small village though. Or Google suggests maybe a portion of some other city. Dunno.